Get Messages (SMS Text) From Phone's Message Store. Add/Modify Tag, Pin and F/U Date. Instantly Access Starred Message by pressing floating button at Home Screen. Search anywhere at Sender Info, Text and Tag. Quickly filter for F/U Date. Gets Messages from SMS store, it lets you Pin, Tag & set Follow-up date for those. Enables you to access those tagged messages quickly. Yes, it can neither send nor receive messages, it cannot make calls. It cannot communicate to internet. Three categories, Starred (One item only), Pinned and Un-pinned. Where does PinTEXT store Messages? 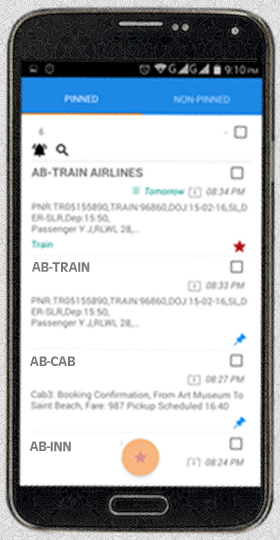 Messages are stored in the Application area, allotted by Android. Why PinTEXT requires permission to access SMS? PinTEXT just requires permission from Android to READ SMS, it is not designed to send and receive SMS. Why does PinTEXT require to read Contacts? When messages are retrieved, it contains only sender number, to have the name, it needs to access Phone Contact. What if I delete a message from PinTEXT? 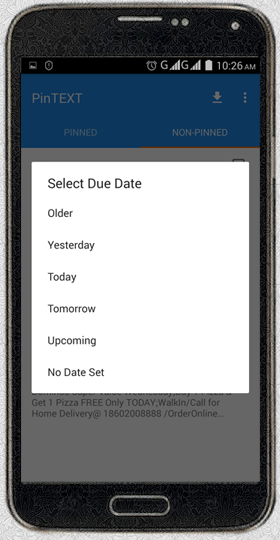 During import process PinTEXT makes a copy of message and stores it locally along with Pin Type, Tag and Follow-up date. Deleting messages from PinTEXT will not reflect at your Message Application, also deleting at your Message application will not delete it at PinTEXT. What if I change the Name at my contacts after importing Message? The changes made at Contacts after importing a message will not have any effect at PinTEXT, PinTEXT would continue showing the information retrieved at the time of import. Currently there is a Starred Message, what happens if another Message is Starred? New Message will become Starred, previously Starred Message will be made to Pinned. Legal Disclaimer: Android, Google Play and the Google Play logo are trademarks of Google Inc.